LOOKING FORWARD TO SEEING YOU AT THE KENTUCKY SPRING PREMIER SHOW! In 1990, Kentucky Spring Premier was born from the wishes of a small group of American Saddlebred enthusiasts who were interested in establishing a quality spring horse show. The idea was to have a spring venue to showcase the American Saddlebred horse, along with Hackney ponies, Roadsters and Saddle Seat Equitation at the Kentucky Horse Park. The only dates originally available for the old covered arena were on Kentucky Derby weekend. Although some competitors found it difficult to spend the entire time at the show if they wanted to head to the Derby, the show would still see steady turnout and many faithful who would stay to show even on Derby day. In 2010, the show was moved to the new state-of-the-art indoor facility at the Kentucky Horse Park in Lexington, KY, which housed some of the Alltech FEI World Equestrian Games events in 2010. The new arena, footing and stabling was well received by many participants. The competition dates were also changed (to avoid Derby conflicts) in an effort to encourage even more participation. As a Charity driven show, the KY Spring Premier has held silent auctions, pitch a pig contests and other efforts to raise money for such charities as Thursday’s Child and the American Saddlebred Museum. The show provides a laid-back atmosphere while allowing exhibitors a first class horse show in a beautiful setting. There is nothing more beautiful than Kentucky in the springtime and no place on earth is more spectacular than the Kentucky Horse Park. 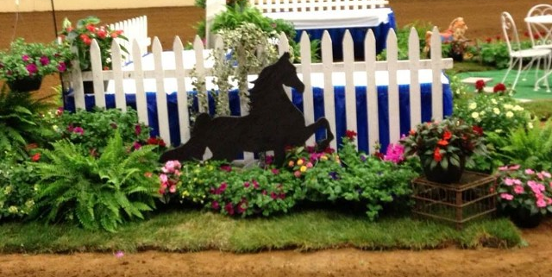 We hope you will come join us at the Kentucky Spring Premier American Saddlebred Horse Show. The three-day full schedule includes a wide range of performance classes for Saddlebreds, Hackneys, and Road Horses.